The line is found in both the Gospel of Luke and the Gospel of Matthew. Thomas Stegman, S.J., a Biblical scholar at Boston College, says the original Greek is the same in both cases. The Greek verb for lead is “eisphero” and the original Greek word for testing or temptation is “peirasmos." Father Stegman pointed out that Biblical scholar Daniel J. Harrington, S.J., in Sacra Pagina, “proposes the petition refers to ‘the final, eschatological testing through which all must pass.’ He refers to the notion of God as one who tests or tries as found in passages such as Pss 11:5 and 26:2. “However, if one understands peirasmos as enticement to sin, then the pope's recommendation, in my opinion, is not only theologically sound but also exegetically defensible,” Father Stegman said. Meanwhile, in 1 Corinthians (10:13), Paul “insists that God does not allow one to be tempted beyond one's strength, and also provides the way to escape,” Father Stegman said. The Italian bishops’ conference in 2008 adopted a new translation of the Bible; for the Lord’s Prayer both in Matthew 6 and Luke 11, they chose “do not abandon us in temptation,” although they did not order the change in liturgical use. The Greek word peirasmos first appears in Luke in 4:13, in a phrase referring to Jesus’ temptation by the evil. He pointed to other uses of the phrase in Luke: “In 8:13 in the explanation of the parable of the sower in connection with the seed thrown on the rock (i.e., shallow soil), those with no root fall away in time of temptation/testing. In 22:28, at the last supper, Jesus commends the apostles for staying with him in his trials; and in 22:40, 46 (garden), Jesus exhorts the apostles to pray that they not "enter (eiserchomai) into temptation/testing." “The latter two instances imply, at least to me, that the prayer is to be protected (by God) from something,” he said. Matthew’s version of the Our Father is longer than the one found in Luke. The version in Matthew includes the line "deliver us from evil,” or tou ponerou in Greek. This story includes updates and reporting from Catholic News Service. "A possible alternative is the phrase “do not let us fall into temptation,” which is currently used by the French church. In his interview, Pope Francis suggested that phrase could be adopted more widely." For an English speaker, a better translation of the new phrase might be "let us not fall into temptation." It preserves more of the old cadence, by adding only 1 word instead of 2, and by not changing more of the word order. #GOOGLE #JOB­­­,,,,,,,­­­opportunity­­­ for­­­ everyone!­­­ Work­­­ from­­­ comfort­­­ of­­­ your­­­ home,­­­ on­­­ your­­­ computer­­­ and­­­ you­­­ can­­­ work­­­ with­­­ your­­­ own­­­ operating ­­­hours.­­­ You­­­ can­­­ work­­­ this­­­ job­­­ as ­­­a ­­­part­­­ time­­­ or­­­ as­­­ a ­­­full­­­ time­­­ job.­­­ You ­­­can­­­ earn­­­ from­­­ 75$­­­ an­­­ hour­­­ to­­­ 1000$­­­ a ­­­day!­­­ There­­­ is ­­­no­­­ limitations, ­­­it ­­­all­­­ depends­­­ on you­­­ and­­­ how­­­ much­­­ you­­­ want­­­ to ­­­earn­­­ each­­­ day­­­. This is an excellent point! I see no real need for change, but it may come anyway. If it does, it would be nice to have it be as simple as possible. Let's just go back to Latin..."et ne nos inducas in tentationem" --no classical lit major here, but with 4 years of Jesuitical Latin under my belt, it seems to be accurately translated. Always curious to know how the original Aramaic went, and the progression from thence to Latin via Greek. The original sounds fine to me. If we used a similar expression such "Lead us not into sin? ", would we not understand what is meant? The line expresses what we would do without God not that God might lead us into temptation or sin. Are we dealing with 16th/7th century English word usage and sentence structure. Did it come from the King James Bible? The Pope is not an English speaker so where is the origin of this? Any change is tough. One person who leads the before-mass rosary uses "you" and "your womb" in the Hail Mary. Not having the "thee" "thou" and "thy" throws me off. The rhythm, the cadence are different; it is less meditative. Yet this leader doesn't change the Lord's Prayer; it still has "thy" three times The rosary and the Our Father are more than words. they are a bit like communal singing. But I am old; any change is tough for me. "Let us" as a phrase is most widely interpreted, by way of its most usual employment, as "Shall we" (as in, ...go to the store today) or more colloquially, "let's." IOW, it is used when talking to ourselves, usually collectively in a group; encouraging or suggesting to ourselves, if you will. It does not usually mean, as would be suggested here: "God, please don't allow us to fall." Thankfully, Fr. Stegman has given some context to this unfortunate self-inflicted and unnecessary "controversy," generated once again in an informal interview by the Holy Father. His denigration of this historical and ecumenical phrase by his side comments and his apparent failure to recall/know how this was handled in the Catechism, in Church Tradition and among other Church traditions seems so imprudent. 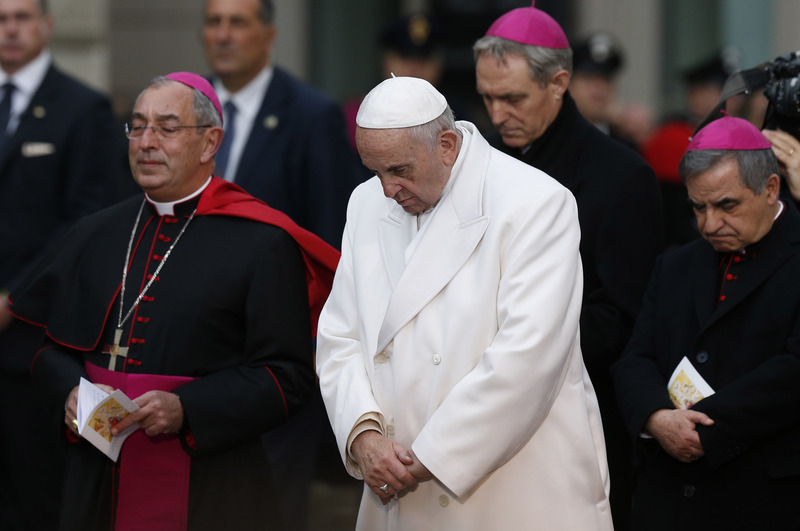 I wish Pope Francis would have dealt with this more wisely and diplomatically, given its central position in our prayer life and the possible disruption this might generate for the whole Christian world. So many devout Christians everywhere need not be faced with a negative interpretation in their daily prayers. The best short summary of the meaning of the phrase "Lead us Not into temptation" is in the Catechism, which devotes 4 numbered paras to it (CCC 2846-49) and acknowledges the possible misunderstanding but is also respectful of the long tradition across Catholic, Protestant and Greek Orthodox uses. Note for reflection the opening of Chapter 4 in Matthew: "Then Jesus was led up by the Spirit into the wilderness to be tempted by the devil." This certainly seems like a testing interpretation. I am worried about the ecumenical fall-out, since it is great for all Christians to be able to use the same words when praying the Our Father together. The Authorized King James, the 1899 Douay-Rheims, the 1599 Geneva Bible, the Greek Orthodox version, the NIV & the RSV all use "lead us not into temptation" in Mt 6:13. I have no concern about better translations, as long as they are handled more delicately and with respect for tradition. St. Jerome's Latin Vulgate uses the word "tentationem" in Matt 6:13 and the 1582 Rheims English translation of the Vulgate New Testament kept the word "tentatio," which means "trial" or "test" (it included an explanatory footnote: "Suffer us not to be led…God permit us to be tempted"). The Church's lectionary NAB version uses "do not subject us to the final test" and the NRSV-CE uses "do not bring us to the time of trial." But, please not in an interview where the alternative is mocked. Who became confuse? The current translation has served us well for centuries and caused no confusion. God Desires that we desire to overcome our disordered inclinations so that we are not led into temptation, but become transformed, through Salvational Love, God's Gift of Grace and Mercy. Although it is not a sin to have disordered inclinations, it is a sin to not desire to overcome them. Our Call to Holiness, has always been a call to be chaste in our thoughts, in our words, and in our deeds. Love, which is always rightly ordered, can make all things new again. "With God’s grace and our perseverance, chastity is not only possible, but it will also become the source for true freedom for all of us." Once again Pope Francis speaks and the faithful who have been reciting the Our Father for millennia without confusion are now confused. It is said is the Pope is a very nuanced thinker and the actual meaning of his writings and/or "sound bites" of what he has to say are often not helpful and confusion reigns. confusion not for the head of the One, Holy, Catholic, Apostolic Church. case when he speaks or writes on economic systems, capitalism, climate change, immigration and other worldly matters, several factually in error, or even matters of a possible/potential change in long held Catholic doctrine which are walked back or explained later by a Vatican spokesperson. By any normal reading of the Greek, this is very hard to justify. The Greek uses an active verb, "do not bring us into," which is functionally the same as "lead us not into." Sounds like this is just trying to rewrite the Bible to make God sound a bit nicer. My Greek exam requires students to parse Matthew 6:13, putting the following down for εἰσενέγκῃς: verb: aorist active subjunctive second person singular of εἰσφέρω, which means to carry inward (literally or figuratively), bring (in), lead into. You have a point, grammatically. I'm not a scholar, but my professor finished his doctoral studies at the Biblical (SSD) this year, so he seems aware of the most recent scholarship. I concur. The laity unschooled in Greek is surely perplexed by the current translation. I know I am. I'd go even farther with a translation that states: "give us the strength to resist temptation." suggested translation and, yet, another campaign in the "Liturgy Wars"
I have shared the Pope's observation for years. I think most people just recite this prayer from rote because they were taught that way at a very young age. But when you actually think about the words you're praying, it is awkward, in English, to ask God NOT to lead us into temptation. I have personally changed my prayer to the more positive form: "Lead us away from temptation, and deliver us from all evil." Amen.